Background: Cross-breeding of transgenic mice is commonly used to assess gene-gene interactions, particularly in the context of disease. Strain background changes can influence the phenotype of mouse models and can confound crossbreeding studies. We sought to determine if changing the strain background of a commonly used mouse model of tauopathy (rTg4510) would significantly impact the originally reported phenotype. On the original F1 FVB/N x 129S6 background, rTg4510 mice present with progressive cognitive decline, increased insoluble tau, robust tau pathology and age-dependent neurodegeneration. One of the most common strains in mouse modeling is C57BL/6. We and others have previously reported that this strain background alters the phenotypes of various models, including the JNPL3 model of tauopathy. To determine if the phenotype of rTg4510 mice was similarly affected by the introduction of the C57BL/6 background, we compared rTg4510 mice on the original F1 FVB/N x 129S6 background to rTg4510 mice on an F1 FVB/N x C57BL/6NTac (B6/NTac) background, herein termed rTg4510B6. Results: Despite a small, but significant increase in soluble human tau levels, young rTg4510B6 mice had equivalent levels of tau phosphorylation, aggregation and cognitive impairments as age-matched rTg4510 mice. At 6.5 months of age, rTg4510B6 mice displayed hyperphosphorylated insoluble tau and robust cortical tau neuropathology that was equivalent to age-matched rTg4510 mice; however, 10.5-month-old rTg4510B6 mice had greater amounts of phospho-tau in the cortex and hippocampus when compared to age-matched rTg4510 mice. Non-transgenic (NT) littermates of rTg4510B6 (NTB6) mice also had greater amounts of cortical and hippocampal phospho-tau at 10.5 months of age when compared to NT littermates of rTg4510 mice. Additionally, older rTg4510B6 mice had gross forebrain neurodegeneration that was equivalent to age-matched rTg4510 mice. Conclusions: Overall, our data shows that introduction of the C57BL/6 strain into the rTg4510 mouse background modestly alters the tau pathology that was originally reported in rTg4510 on the F1 FVB/129 background. In contrast, behavioral and neurodegenerative outcomes were not altered. 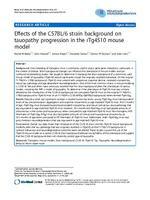 These studies support the use of the rTg4510 mouse model on a partial C57BL/6 strain background without losing fidelity of the phenotype and suggest that the C57BL/6 background does not inherently protect against tauopathy.